Here is another very helpful video – for those who seek to understand what the Flotilla is all about. When the Gazan “Islamic scholar” concerned talks of “Khaybar” he refers to the destruction of a Jewish settlement. It has to be obvious that the so-called Flotilla was Jihad on the high seas. Have to say how disgusted I am by the comments of William Hague – that gutless little shill. The more educated reader will know that the Turkish organisation IHH was a primary mover in the Flotilla of Hate. So, who ARE the IHH. Well. here is a detailed analysis of this organisation. The key summary? Now, all of this goes over the heads of the Jew-haters, the perverse advocates for the second Holocaust (Assuming they believe the first one happened!) but I always think is a good thing to provide background. The IHH – THIS is the true identity of a key organiser of the Flotilla of Hate. I thought this might help quell the fevered imaginations of the pro-Hamas community….always good to review facts, right? 1. A state of armed conflict exists between Israel and the Hamas regime controlling Gaza. The Hamas terrorists have launched over 12,000 rockets against Israeli civilians, and is presently smuggling in Iranian arms and military supplies into Gaza, by land and sea, in order to fortify its positions and continue its attacks. 2. Under international law, Israel has the right to protect the lives of its civilians from Hamas attacks, and, consequently, has undertaken measures to defend itself, including the imposition of a maritime blockade to curb Hamas rearmament. Under international maritime law, when a maritime blockade is in effect, no vessels can enter the blockaded area. 3. In line with Israel’s obligations under international law, the ships participating in the protest flotilla were warned repeatedly that a maritime blockade is in effect off the coast of Gaza and were given due notice of its exact coordinates. 4. Israel repeatedly offered the flotilla organizers to land in the port of Ashdod, and to transfer their aid to Gaza through the existing overland crossings, in accordance with established procedures. Thousands of tons of humanitarian supplies are allowed in by Israel through the land crossings. The flotilla organizers rejected this offer, stating clearly that “this mission is not about delivering humanitarian supplies, it’s about breaking Israel’s siege.” (Greta Berlin, AFP, 27May10). 5. While the organizers claim to have humanitarian concern for the residents of Gaza they did not have similar concerns for the fate of the abducted Israeli soldier Gilad Shalit, and when asked, refused to even make a public call to allow him to be visited by the Red Cross. Shalit has languished in a Gazan dungeon for over three years. 6. When it became clear that the protest flotilla intended to violate the blockade despite repeated warnings, Israeli Naval personnel boarded the vessels of the flotilla, and redirected them to Ashdod. 7. Given the large number of vessels participating in the flotilla, there was an operational need to undertake measures to enforce the blockade a certain distance from the area of the blockade. 8. The intention of the flotilla participants to resist Israeli Naval personnel was made clear in numerous television interviews on 30 May given by the head of the IHH, Bulent Yildirim on board the Mavi Marmara (as he held a year-old infant in his arms, in what he called a “message” to any Israelis planning to act against the flotilla). 9. The Israeli Navy was met with violent opposition, two pistols were found in the hands of protesters, and over a dozen Israeli personnel were hospitalized, some in critical condition. The Navy described being met by a “lynching” party. A word about those alleged peaceful activists bobbing about on the Flotilla of Hatred. Check out the video below as these “humanitarians” show their peaceful intent by beating IDF soldiers to within an inch of their lives with metals bars, then they throw an IDF soldier overboard in a further act of extreme peacefulness; In truth they are vicious hate-fueled savages. The fact that the “International Community” unites to condemn Israel is predictable, if nauseating. It seems to me that so much of the world wants Israel to lie down and let Hamas and their pals tramp them into the dirt. But the spirit and resolution of the Israeli people is admirable and I stand 100% behind them. ATW – PROUD to support Israel. That these floating fools refused the generous offers from Israel AND Egypt to take their aid to Gaza tells you all that you need to know. The refusal of the media to tell the Israel side of this is a scandal but then, as you may remember when Israel defended itself against the savages in Hezbollah, biased reporting is par for the course. Some believe that the origins of the Coopers Hill Cheese Rolling and Wake predate the Roman occupation, some link the event to an old heathen festival which celebrates the return of spring and others believe it is associated with fertility rights and the hope of a bountiful harvest. Whatever the truth, Englishmen have been chasing a round of Double Gloucester down a steep hill in the Cotswolds for hundreds of years and a piffling ban (because “crowds are becoming too large” – yeah right) will not stop them. So I raise a few to my fellow stout bulldogs who today raised two fingers to petty officialdom and went at it like the lunatics they no doubt are. Truly, there is nothing so noble as to pass on our customs and traditions and, if that means breaking your neck, so be it. I’m sure you will agree, as the footage from last year shows, it looks like an awful lot of fun. Who, me? You must be joking. I had dubbed the flotilla of double-standard Hamas supporters as Dumbkirk. Their journey from Cyprus seemed the most ridiculous since Gilligan and his mates set sail on their three hour cruise. Now Israel has gone and given them more publicity and moral standing then they could have ever obtained on their own. Israel’s actions in international waters deserves international condemnation. The deaths were avoidable and there was no threat by these ships and their cargo to Israel’s security. Add to the unnecessary human loss the political and public relations disaster of grossly offending Turkey, a genuine ally, under whose flag several of the ships operated, and providing the anti-Israeli voices of the world with a bona fide rallying point. I defend Israel against those who seek her destruction. I also seek to defend it against those who seek her self-destruction. The absurd grasping of straws that some folks are doing to justify or excuse this fiasco serves neither justice or Israel. This was a grave error that will have ripple effects for years to come. Here is how those peace loving “activists” deal with Israeli soldiers..
You should go here and watch a video of those peace loving Flotilla folks and their supporters chanting Intifada songs and calling for martyrdom. Give it a for minutes to load. Israel should be congratulated for granting them their wish. I see that Her Majesty The Queen is demanding her first pay rise in 20 years to plug a looming £6million deficit in the royal household’s finances. Palace officials have warned the Treasury they need a dramatic rise in the £7.9million annual civil list to maintain spending on state duties. The request is politically explosive at a time when the new coalition is imposing draconian £6billion public sector cuts to bring down Britain’s record deficit. Why is this “politically explosive”? The allowance afforded to Her Majesty was frozen by Blair in 2000, having been set by Major in 1990. So that is 20 years at the same rate. If politicians think the Royal Fmaily should not get an increase, can they explain why their salaries are not set at 1990 levels. 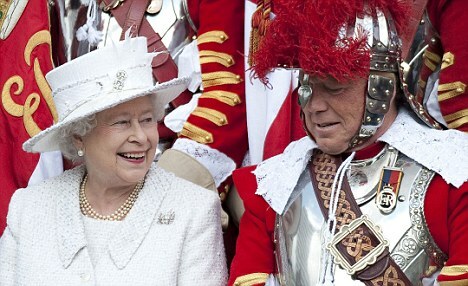 The Royal Family is one of our greatest assets and Her Majesty thoroughly deserves an increase. I trust Mr Cameron will do his duty. I read that ” there is concern that illegal weapons are still available” the leader of the Progressive Unionist Party has said. Wow, now WHO would have thought that? Dawn Purvis was speaking following the murder of Bobby Moffett, 43, who was shot dead on Friday by two masked gunmen on Belfast’s Shankill Road. She said the UVF had made clear they had destroyed all weapons under their control and the killing could have serious consequences. What are these “links” to the UVF, exactly? Does Ms Purvis condemn all UVF terrorism? Does she believe that the UVF killers that have slaughtered so many innocent Roman Catholic people deserve an amnesty? Does she accept that UVF terrorism was wrong and that all involved deserve to be in a prison cell? Or does Dawn speak with a forked tongue? PUP and Sinn Fein – two sides of the one coin.